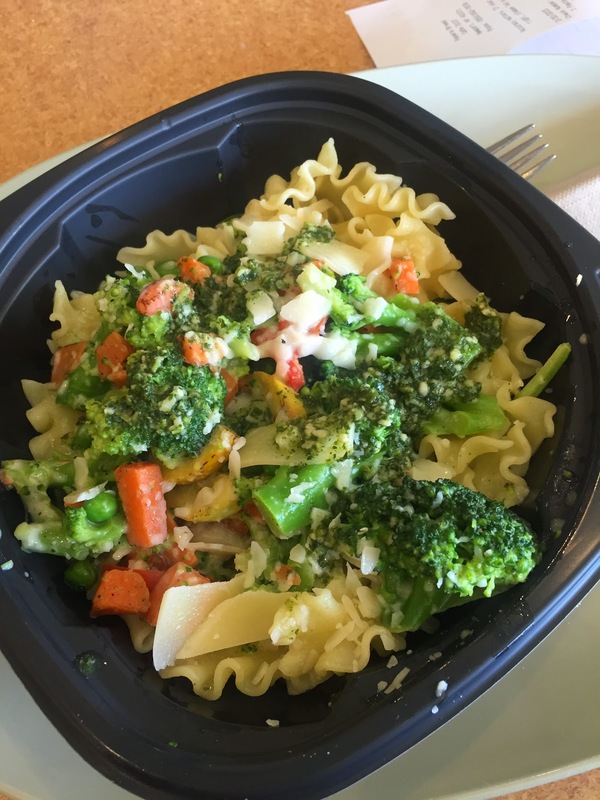 Restaurant Review: New Pasta Primavera at Panera Bread | The Food Hussy! Tender, ribbon-shaped noodles tossed with a blend of vegetables in a lemon garlic cream sauce on a bed of fresh spinach and topped with asiago-parmesan cheese and basil pesto. This was pretty good - I liked it much better than the broth bowl - it had more substance - but you could tell it was microwaved (plastic container = dead giveaway). I would like more variety in the vegetables - it's mainly carrots, broccoli and peas. Dawn found one piece of red pepper and I found 2, mushrooms & asparagus would have been great in it. The sauce is light but the garlic is strong - which was great because I love garlic. At $7.99 it's maybe a bit pricey - I'd love to have this in the You Pick Two - I'm not sure why it's not - they could easily do 1/2 portion - with 1/2 salad. I can say one thing though - I've tried many of their pastas and this is by far the most successful.